Last weekend the good weather saw us paddling along Studland beach. The tide was out, so we took Jessica up to the rock pools and re-discovered a set of caves I’d forgotten existed. That evening I went back to shoot from one. It’s a shot I think I’ll need to reshoot, but thought it was fun enough for an initial post. I’m going to watch my tide tables and feet a little more to get smooth sand coming into the cave, and would ideally see a little less cloud for a final frame. There’s a strange ghosting from the TS-E here – I think the issues come from shooting straight on, close focused on the rock of the cave. Next time I’ll see what I can do getting the girl closer to focus. There’s a little cloning on the left hand cave wall to remove a distracting chalky stain, but everything else is in camera as always. Three half power flashes of Canon 600EX-RT from 2m camera left to light cave. 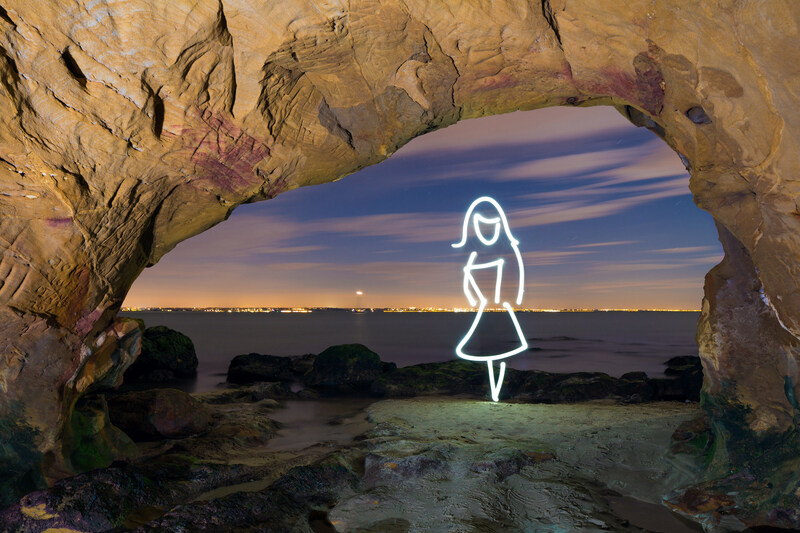 Girl is hand drawn with LED flashlight with sock as diffuser.